Can't Afford a Valentine's Day Card This Year? Don't panic! Right-click on the image below to save it to your desktop. You can print it out or e-mail it as an attachment to your Valentine--it's totally FREE! 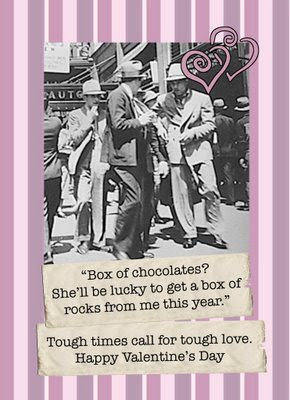 More Great Depression-themed Valentine's Day cards available in the online Cafepress store. Friedrich Nietzsche, the 19th century philosopher, was perhaps the most pessimistic human being to ever have lived. This is a guy who said things like, "Ah, women. They make the highs higher and the lows more frequent." - "The demand to be loved is the greatest of all arrogant presumptions." - "A pair of powerful spectacles has sometimes sufficed to cure a person in love." - "The separation between us is thereby decided in really the most absurd way." - "Love is a state in which a man sees things most decidedly as they are not." See more Nietzsche quotes on Valentine's Day cards at: http://www.cafepress.com/orderofstnick/6341614. Kettle has a whimsical artistic style that is unmistakably his own, and now he's bringing his talents to Order of St. Nick to headline the new "Sweet and Sour Valentines" greeting card line. The “Sweet and Sour Valentines” celebrate the joys of love, as well as its flip-side: rejections, break-ups, and loneliness. One card, featuring a painting of a robot and a woman on a park bench, says “Your rejection of my advances does not compute.” Another, more optimistic card, simply says, “That was fun. Let’s do it again. ;) "
Kettle’s work can be found in galleries and private collections throughout the United States, including the Whitney Museum of Art in New York. Most recently, the one-name artist was tapped by trading card publisher Topps to provide 50 “artist sketch cards” for its upcoming Star Wars Galaxy Series IV collection. For more information on Kettle, and to see his extensive online gallery, visit http://kettle.mosaicglobe.com. Six different Kettle designs, part of Order of St. Nick’s “Sweet and Sour Valentines” series of greeting cards, are available exclusively online. Order of St. Nick has the widest selection of funny Christmas cards and humorous greeting cards. As seen on "The Colbert Report" and FOX News! Find the perfect card for everyone on your holiday card list, regardless of religious persuasion, political affiliation, or sexual orientation. Whether you need to wish someone "Happy Birthday" or "Merry Christmas", Order of St. Nick has a unique card for every occasion featuring original cartoons and artwork. Made with real paper--for when you care to send more than an e-card!